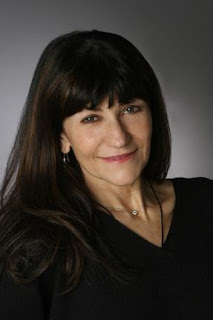 Rosemary Harris, author of the Dirty Business mysteries, will speak at the Velma Teague Library, 7010 N. 58th Ave., Glendale, on Friday, Feb. 20 at 2 p.m. as part of the Authors @ The Teague series. She will discuss and sign her books at the free program. Call 623-930-3431 for details. It's a caper novel, with murder, casinos, bumbling Ukrainian gangsters, a bear, a pitchfork, and a gardener. It must be Rosemary Harris' latest Dirty Business mystery, The Big Dirt Nap. It's the off-season, so it's the perfect time for Paula Holliday, owner of Dirty Business Gardening, to meet a friend for a weekend getaway. There's the added incentive of the possible flowering of a corpse flower, an unusual addition to the lobby at the Titans Hotel. But, Lucy is a no-show, and Paula finds herself identifying the corpse of a man who tried to pick her up in the bar. Paula can't help poking around though, while she waits for Lucy, who texts messages that tend to get more obscure. She hears rumors about casinos, Ukrainian gangsters, and kidnappings. After a run-in with a smart-alecky police detective, Paula gives up on her friend, only to be followed on the road. When her home is broken into, Paula worries that Lucy might be held somewhere against her will. So, there's one more trip back to Titans Hotel, a place now out of a nightmare. Not the ordinary weekend in the life of a gardener. Since it's the off-season, there are fewer gardening details in this book than in the debut mystery, Pushing Up Daisies. But, gardening fans will still appreciate details about Paula's business, and, of course, the corpse flower. Harris' new book is a wacky adventure for poor Paula. Paula is a loyal friend, and she engenders loyalty in return. This is a series with strong secondary characters, particularly Babe, owner of Babe's Paradise Diner. With the trip out-of-town, I found myself waiting for Babe's first appearance, and I wasn't disappointed. If you're in the mood for a fast-paced, quirky mystery, with interesting characters, The Big Dirt Nap might fit the bill. 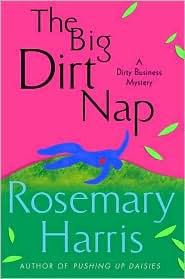 The Big Dirt Nap by Rosemary Harris. Minotaur Books, ©2009. ISBN 978-0-312-36968-2 (hardcover), 256p. I read the beginning of this book on the St. Martin's Press Read-It-First Program, where you get e-mailed a few pages every day for a week, and it seemed pretty good. I loved Pushing Up Daisies so I am eager to read the second. I understand, Caite. I have a small library, so I'm very lucky, I'll admit. I was a little impatient for Babe. I'm a big fan of hers. She's one of my favorite characters in this series. Hope you like this one! Thanks for the kind words! Interstingly enough, after I wrote Pushing Up Daisies I started a different book and Babe wasn't in it at all, but I really missed her, so I shelved that one and wrote The Big Dirt Nap instead. BTW there's a short story on my website that features Babe, 20 years before Daisies. It's called Growing Up is For Losers and it was nominated for a Derringer last year. Cheers and see you soon! I had to work a few hours today to clear our bookdrop and I checked in Pushing Up Daisies. I took a look at it and will plan to read it soon. Thanks for always highlighting new books for us, Lesa! I'm so glad you didn't drop Babe. She's an important character in these books. I'll have to check out the short story. See you Friday! You're welcome, Kay. Good sign that someone returned Pushing Up Daisies. That means it's circulating.